Baggage tractors come in a wide variety of sizes and models, typically ranging from 3,000 to 8,000 LBS drawbar pull (DBP). 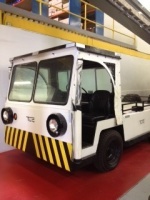 They are used to move bag carts,ground power units, lav and water serviceing carts. The larger capacity baggage tugs are also used as pushback tugs for commuter aircraft up to 90,000Lb in weight. We have a large amount of baggage tractors in stock, ranging from 3,000 DBP to 8,000 DPB. These include Harlan, Tug, Clark, Toyota, NMC Wollard,Tiger and various other types. We have gas, diesel, and propane baggage tractors in stock. If you do not see what you need here, please contact us as we have new stock arriving weekly. If you are needing to move something with a heavier weight you may want to consider an aircraft tug/ pushback tug. Used Tug MG-40 aircraft tug/ baggage warehouse tractor with modern 4-cylinder with fuel injection has a gas engine with low hours. 4,000 lbs DBP. Fitted with hard rubber tires. Perfect for warehouse use.